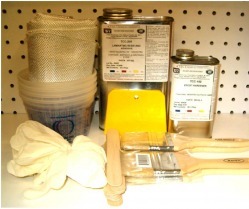 Complete line of resins for repair, Manufacturing, and tooling. For many more Resins and products please feel free to visit cass polymers website by clicking on there logo to the left. 1 Sq.Yard Cloth in three different styles to choose from.. 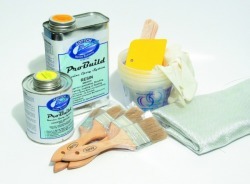 The FRK 528 kit is one of the most complete fiberglass repair kits you will find. complete with graduated mixing cups, gloves, stir sticks,as well as a yard of premium fiberglass with high grade finish for promoting maximum bond with the resin. The PROBUILD resin is one of the most versatile resin with several hardeners to choose from witch allows full cure even in low temperatures. PROBUILD was designed for the marine industry with great wet out characteristics, UV stable, excellent strength and an easy 3 to 1 by weigh mix ratio at a low cost. With these characteristics Probuild is rapidly becoming popular in the auto repair, hobbyist, industrial, construction markets as well as the marine industry. For more for technical data and MSDS on PROBUILD visit Adtech Plastics. High proformance resin specifically formulated for use with any of the following hardeners to produce the highest quality marine laminating system: Fast & Cold Weather Hardener, Medium Hardener, Slow Hardener, Tropical Hardener. Epoxy resin TCC-205 with eather epoxy hardener TCC-102 or TCC-104 is a rigid epoxy system having low viscosity and a short pot life. Epoxy resin TCC-351 with epoxy hardener TCC-102 is a brilliant white surface coat which provides a resilient first coat for laminated molds and models. The viscosity of the resin and hardener are designed to be easly dispensed. SUPER LOWEX LUC-4105 is a riged urethane polymeric system developed to create a low exotherm, fast set casting system with "safety OSHA handeling" characteristics that can be used in same day tooling and reproduction applications. Typical applications include: Prototype parts, Duplicating mandrels, Tracer models, Matchplate fixtures, Latex molds, Core boxes, Nesting fixtures, Vacuum form molds, Trim fixtures, Production parts, and Pattern and core duplications. EL-323 TC COMPOSITE TOOLING COMPOUND is a new and improved material for the construction of tools, jigs, models and other tooling requirements. This system saves a considerable amount of time and labor. EL-232 TC has a convenient mix ration (1:1 by volume). SC12657 5 Gal Resin Jug w/ Spout. We have these items marked at $8.50 ea. This can be filled from any bulk supply.